Mexico's textiles and apparel industry is violating workers' basic rights including freedom to unionise, overtime and severance pay, according to the Human Rights Commission of Tehuacan, a major maquila hub in Puebla State two hours south of Mexico City. "The textiles industry continues to incur labour violations, workers are not represented in collective wage agreements and often work 12 hours with no extra pay," says the organisation's boss Martin Barrios. Top clothing makers such as Kaltex, Navarra, Industrias Oxford and CMT Denim and other similar firms generally meet the law because their US fashion clients require them to uphold certain global standards. However, many outsourcing firms working for them don't, Barrios claims, adding that these workshops engage in worker abuse and intimidation and can sometimes employ children. Barrios's comments come as the Colectivo Obreras Insumisas de Puebla, another workers' advocacy group, in June filed a collective complaint from several Tehuacan female workers, saying many suffered psychological bullying, sexual harassment and racial discrimination. Operators demanding their labour rights were put on blacklists and denied employment elsewhere. According to Barrios, 60% of Mexico's large manufacturers, which in Tehuacan's case sew for the likes of Polo Ralph Lauren, VF Corp, Donna Karan, Gap, Calvin Klein and most recently Zara, hire outsourcing firms. While many violations take place in Tehuacan, a major textiles manufacturing hub employing 50,000, workers also endure similar conditions elsewhere in Mexico, Barrios says. He notes workers are caught in a vicious cycle involving so-called "sindicatos charros" or corrupt unions favouring employers rather than workers. "The great majority of clothing made for CK, Gap, H&M, Inditex or other US or European brands comes from factories where workers don't participate in collective wage agreements," Barrios claims. "This is because 90% of wage contracts are based on collective agreements favouring companies where workers can't participate." Barrios adds the country's top trade unions Croc and CMT operate in this way and that the very few truly independent unions are very small, localised and powerless. When foreign brands adhering to strong codes of conduct come to inspect maquilas, workers are threatened to fake conditions are good and are asked to wear mouth shields and other security and hygiene gear," Barrios claims. He adds maquila minumum salaries average MXN100 to MXN150 daily (around $6-$8) and that a 2012 labour reform allowed employers to hire people on temporary outsourcing contracts, robbing workers of fixed benefits. Many firms also fail to pay social security or other severance compensation when firing workers, often pocketing such payments, according to Barrios. He says the Tehuacan group has teamed with the US AFL-CIO trades union group and other NGOs to pressure the Secretary of Labor to enforce laws, but that these efforts have been largely ignored. Similar entreaties with the brands have been mostly unsuccessful, Barrios adds. Officials at clothing industry trade association Canaive vehemently deny the accusations, saying rights improved after the 2012 labour reform aimed at ending employers' abuse of temporary contracts, spurring new worker protections. "The laws are being respected in formal and legal commerce," Canaive's general manager Jose Manuel Martinez says, adding that export maquilas caught violating worker rights can get suspended. "I have no news of labour rights worsening." However, Martinez concedes small workshops operating in Mexico's huge informal economy (which represents nearly 60% of the economy) may engage in violations. In those cases, because they operate illegally, Canaive has no power to regulate them and it is local governments' job to punish such firms. "Workers in informal shops have to file their claims with local authorities. They have to enforce the law," Martinez says. He says foreign apparel labels operating in Mexico are stepping up efforts to "certify" companies to meet stricter labour and safety operational standards and that Canaive and the government are helping them do this. He adds these certifications – which now also include 'zero discharge' environmental initiatives – have increased 30% to 40% in the past few years. "We do not want another Bangladesh in Mexico," Martinez says, adding that a large, unnamed US manufacturer recently visited its Hidalgo, Puebla and Mexico States plants to monitor conditions. Martinez says the NGO claims stem from "desperate people losing jobs from falling orders" as the US has cut demand and Mexico's industry continues to struggle to compete against Asian rivals, with exports faltering despite the peso's continued decline against the dollar. 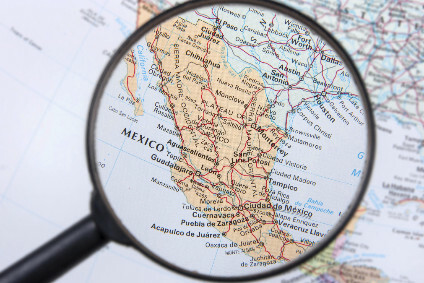 He concludes Mexican conditions are better than in Central America where neighbour Guatemala is battling a US labour suit under the Dominican Republic-Central America Free Trade Agreement (DR-CAFTA). "Conditions are better on average, especially in Central and Northern Mexico, but if you ask me if they may be similar in Oaxaca or Chiapas (southern states bordering Central America)."